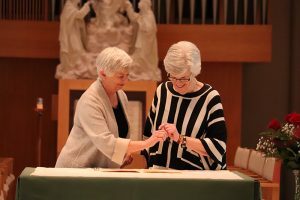 March 7, 2019, Adrian, Michigan – Kathleen Woods, Chair of the Adrian Dominican Sisters’ Portfolio Advisory Board (PAB), was formally accepted as an Adrian Dominican Associate March 1, 2019, during a festive afternoon. 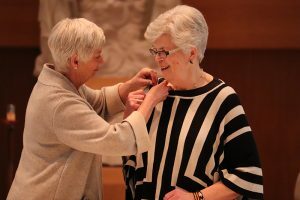 The Ritual of Acceptance was preceded by a 45-minute concert by pianist Timothy Hollinsead, husband of PAB member Leslie Watson-Hollinsead. The event was sponsored by the PAB. 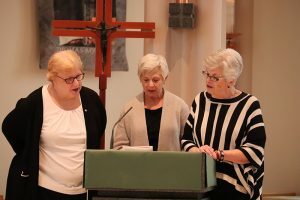 From left, Associates Mary Lach, Dee Joyner, and Kathleen Woods proclaim the Vision of the Adrian Dominican Congregation.